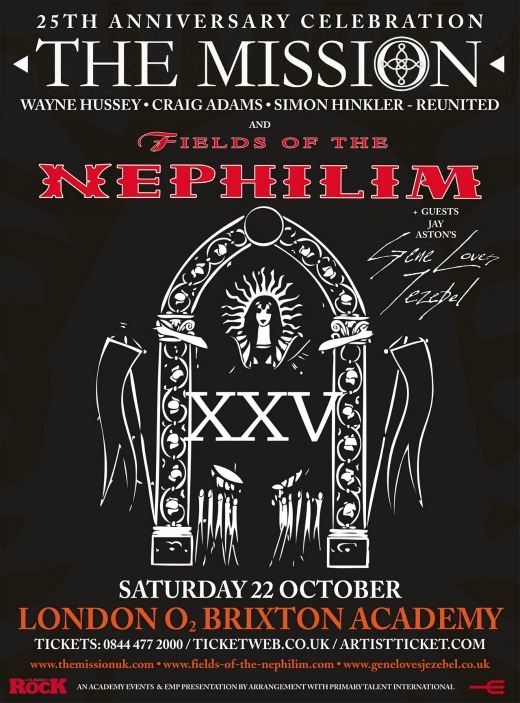 Frontman Wayne Hussey has tapped goth-rock contemporaries Fields of the Nephilim and Gene Loves Jezebel to open The Mission’s upcoming 25th anniversary concert in London — and recently announced plans to add a second U.K. performance and “some mainland European shows” in October. Details of the additional concerts are forthcoming, and, so far, the reunited band — Hussey and original members Simon Hinkler (guitar) and Craig Adams (bass), but not drummer Mick Brown, who opted to sit out the reunion — are only slated to play Oct. 22 at London’s O2 Academy Brixton. The London concert will be the first by The Mission since the band’s string of album-spanning farewell gigs in London in February and March 2008. Hard to believe McCoy of the Nephilim would ever play second fiddle to any band by being openers, lol. Will the brothers of GLJ be back together to play this gig? I hope this line up hits the states! Too bad Mick Brown is not playing with them. @Russ: that’ll be the day! No, it’s Jay Aston’s version of GLJ, sans Michael. Do you think The Mission need the Fields of the Nephilim to guarantee a sell out? The Nephilim too big to support, but will have to go.